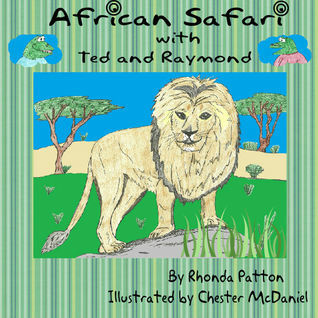 “African Safari with Ted and Raymond” by Rhonda Patton is an educational, entertaining and charming children’s book with beautiful illustrations by Chester McDaniel. Two frogs go on an adventure somewhere in southern Africa where they meet local frogs and see safari animals. I can’t stress how cute and lovable the illustrations are, appealing and in a simplistic child-like style that instantly draws children and adults alike into the book. The holiday and safari descriptions are pleasant, informative and written with much care and love. Instead of scaring us away with warning information about the animals Patton has chosen to point out specifics and facts about the animals that we see. The safari with our frogs is not dramatic and scary but educational and seems to have been written with a view to bring nature and humans in harmony. I loved the fact that it is other animals posing as humans that go on safari, hinting at the idea that we are all part of the animal kingdom and part of the same nature and planet. In a modern world where humans drift away from a natural way of life this book stands out with its magic charm and its subtle and low key message. Most importantly of all however, it is great fun to read. I definitely recommend this book to children and their parents.